Antifa Members Tell War Veteran To 'F*ck Off, Nazi Scum." Antifa members in Boston have reportedly called a former U.S soldier who was deployed to Afghanistan a "Nazi." The incident happened on Saturday and the Antifa members were counter-protesting a free speech rally. Antifa is also known for disliking President Donald Trump. 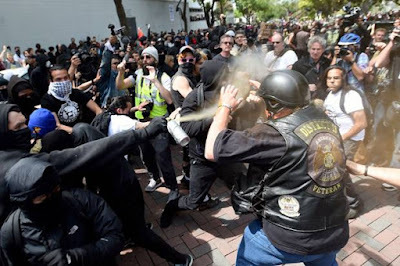 Boston Antifa said on the social media platform known as Twitter “Veterans don’t get a free pass. Today’s Nazi for defending freedom of speech yesterday. You’re most at fault #BostonFreeSpeech #BostonResist." The video shows Antifa shouting at the veteran and him staying extremely calm. A news crew was interviewing a former veteran on Saturday during the free speech rally. This brave former American soldier had said he enlisted in the United States military. He was also sent to Afghanistan. There's even a video of this going down. There's basically a group of Antifa member saying "F*ck Off Nazi Scum." They were pretty close to this guy's face and yet he kept his cool and continued his interview.